I realize it’s been pretty quiet on this blog for a few weeks — I was doing some traveling (mostly for work but with some fun thrown in there as well). But now that I’m back and have returned to the “normal” state of busy-ness I should be able to get a few posts out over the next week or so. In honor of the NHL playoffs starting this week (go Sabres! ), this week’s Friday Field Foto heads north to the Canadian Rockies. 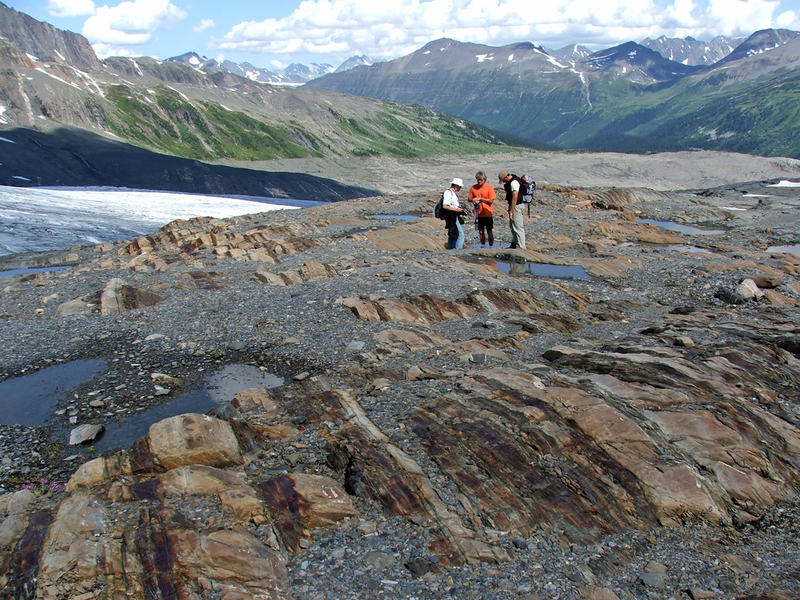 I was lucky enough to go on a trip back in 2008 to look at some Neoproterozoic (~600 million years old) turbidite deposits exposed in the mountains near McBride, British Columbia. These strata are dipping nearly 90 degrees (stratigraphic up is to the left in photo above) and have been cleaned off by glaciation. In fact, you can see the small Castle Creek glacier in the background. The value of this outcrop is that you can hike around on a cross section of the stratigraphy and walk individual beds out for hundreds of meters. The recent glaciation combined with just the right amount of metamorphism (i.e., not much) has resulted in stunning exposures of the fine-grained deposits, which are typically not as nicely exposed as the coarser-grained deposits.